With Joe Gomez, Joel Matip and Dejan Lovren all injured and unavailable for the Brighton clash, Fabinho is practically a certainty to start alongside Virgil van Dijk at the back. The Brazilian is a holding midfielder, who has experience at right-back, but centre-back is a relatively new position for our summer signing – although he did play the 90 minutes there against Wolves in the FA Cup defeat. 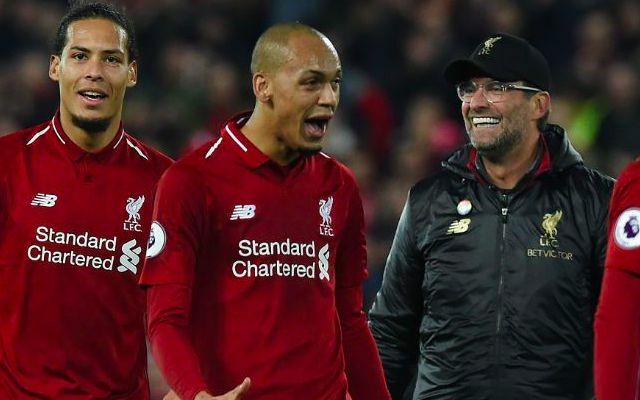 Interestingly, Klopp also said he’d prefer not to overcomplicate things tactically and rely on Fabinho’s footballing ability than give him too much new instruction. “If you speak about Fabinho, if he has to play as a centre-half, for example – which is not sure in the moment – but if, he played it before,” he told the official website. “We do that [planning and adaptation] on the training pitch. With a lot of information you have – and I have it obviously – you can complicate things. What we want is the natural understanding of the game because it’s still only football; if you are a holding six or a centre-half, with the ball it’s easier, without the ball it’s different because you don’t have a line behind you. We have every faith in Fab, especially as Joel Matip should be back for the fixture with Crystal Palace in a week’s time. Following the Brighton game, we hope Fabinho returns to the middle of the park, preferably alongside Gini Wijnaldum, as the pair have developed an acute understanding when deployed in a double pivot.